Not far from where Edwin Land -- the inventor of the Polaroid camera -- made his pioneering discoveries about polarized light, researchers from the Harvard John A. Paulson School of Engineering and Applied Sciences (SEAS) are continuing to unlock the power of polarization. Recently, a team of researchers led by Federico Capasso, the Robert L. Wallace Professor of Applied Physics and Vinton Hayes Senior Research Fellow in Electrical Engineering, encoded multiple holographic images in a metasurface that can be unlocked separately with differently polarized light. This advancement could improve holograms for anti-fraud protection and entertainment, as well as offer more control over the manipulation and measurement of polarization. The research was published in Physical Review Letters. "The novelty of this type of metasurface is that for the first time we have been able to embed vastly different images that don't look at all like each other -- like a cat and a dog -- and access and project them independently using arbitrary states of polarization," said Capasso, the senior author of the paper. Polarization is the path along which light vibrates. Previous research from the Capasso lab used nanostructures sensitive to polarization to produce two different images encoded in the metasurface. However, those images were dependent on one another, meaning both were created but only one appeared in the field of vision. The metasurface made of titanium dioxide, a widely available material, consists of an array of polarization-sensitive pillars -- also called nanofins -- that redirect the incident light. Unlike previous arrays, which were uniform in size, these nanofins vary in orientation, height and width, depending on the encoded images. "Each nanofin has different, precisely controllable polarization properties," said Noah Rubin, co-first author of the paper and graduate student in the Capasso Lab. "You use this library of elements to design the encoded image." Different polarizations read different elements. "This metasurface can be encoded with any two images, and unlocked by any two polarizations, so long as they are perpendicular to each other," said Rubin. "You can also embed different functionalities. It can be a lens for one polarization and if you go to a different polarization, it can be a hologram. 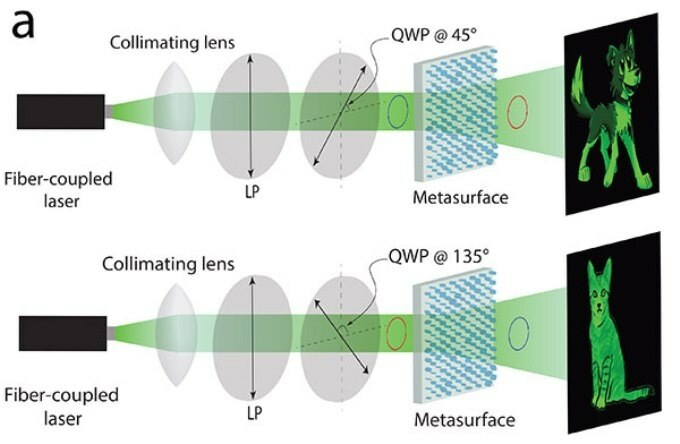 So, this work is general statement about what can be done with metasurfaces and enables new optics for polarization." "This is another powerful example of metasurfaces," said Capasso. "It allows you to compress a number of functionalities, which would normally spread over several components, and put them all in a single optical element."